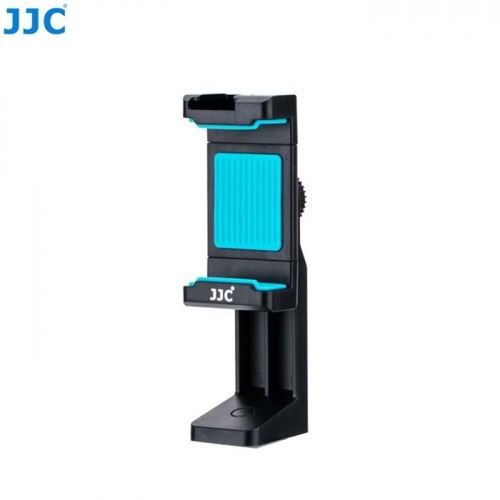 JJC SPS-1A Smart Phone Stand fits iPhone, HUAWEI, MI, Samsung and other mainstream smart phones. With a cold shoe on the top, you can attach LED lamp, flash or microphone with standard shoe to the clip. The clip can be adjusted from 56-105mm, which fits mainstream smart phone with or without a protective case. Moreover, the non-slip pads design can effectively prevent your phone from slipping. The smart phone holder is detachable from the smart phone clip. With the holder, you can rotate your phone 360 degrees for shooting in different occasions. Without the holder, you can attach the clip to a selfie stick or a tripod with 1/4"-20 male thread. The standard 1/4"-20 female thread on the bottom of the holder also allows you to attach the phone stand to the particular devices. 2 colors available: black and blue.